Looking for an incentive that suits your needs? The Men's Wearhouse Gift Card is a perfect choice. When saying thank you to your valued clients, rewarding your employees for a job well done, outfitting your new recruit for success, or simply for traveling, the Men's Wearhouse Gift Card is essential. If you are not sure of the size, or what he needs, give the flexibility of the Men's Wearhouse gift card or egift card. Men's Wearhouse is proud of the value they deliver to their customers. Their commitment includes their quality merchandise, every day low prices, convenience, professional on-site tailors, and great wardrobe consulting. Men’s Wearhouse gift and egift cards are redeemable in-store at any of their 700+ stores nationwide, as well as online. Also, they never expire, so you don’t have to rush to find something you love. Men’s Wearhouse gift cards are the perfect gift for employees, colleagues, and friends because they allow each person to pick the suit that’s right for them. National Gift Card is the best place for you to order Men’s Wearhouse gift cards in bulk. We are the experts in all things gift cards and can set up your gift card solutions program for you today. 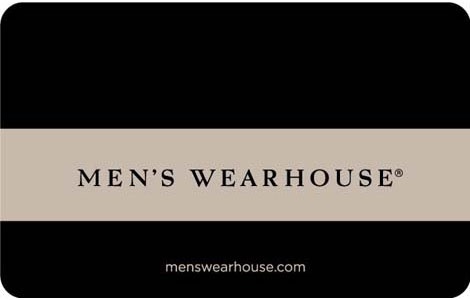 Please contact us for more information on Men’s Wearhouse bulk, direct-to-recipient, or individual gift card fulfillment for your gift card program. Contact us here or call us at 888-472-8747 today. This card is redeemable only at any Men’s Wearhouse, Men’s Wearhouse and Tux, and Men’s Wearhouse Outlet stores, or online at menswearhouse.com for the purchase of merchandise and in-store services. Not redeemable for cash unless required by law. Cannot be applied as payment toward credit card accounts. Cannot be redeemed for online gift center purchases. In the event merchandise is purchased with a gift card and is returned, any portion of the original transaction paid with the gift card is refunded as a gift card. Safeguard this card. Not replaceable if lost, stolen, destroyed, or used without authorization. CardFact 25, Inc. is the issuer and sole obligor to the cardholder. CardFact may delegate its issuer obligations to an assignee, without recourse. If delegated, the assignee, and not CardFact, will be sole obligor to cardholder. Your purchase, use, or acceptance of this card constitutes acceptance of these terms.